Nithya Priyan was introduced to meditation via YouTube 9 years ago, today he is the founder of Nithya Priyan School of Yoga. In his desire to seek the connection between meditation and yoga, he discovered yoga to elevate his meditation experience and wanted to share the benefits of marrying the two with others. 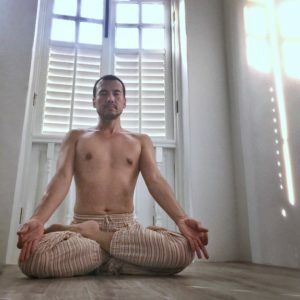 In an exclusive chat with JOZU, Priyan shares what he has learned along his path from student to teacher and tells us more about the Open Heart Retreat, a unique experiential all-inclusive weekend he is leading in Singapore next month. What do yoga and meditation mean to you? In 2008, I was introduced to the concept of meditation through a Guru speaking on YouTube. It led me to an eye-opening adventure traveling in India, exploring ashrams and seeking teachers. I traveled for half a year and experienced to beauty and rawness of India, taking in as much as I could. I finally discovered the practice of Vipassana meditation in a retreat in Igatpuri. Meditation and yoga are like a fork and spoon, or salt and pepper, you deepen your practice by taking up the missing counterpart. Regular asana practice creates a comfortable body-space to sit still in for longer periods of time whilst also improving concentration and the ability to turn inward. Likewise, meditation helps the asana practice by deepening proprioception and body awareness, increasing strength, flexibility, and balance, thereby improving your learning rate of more intermediate poses. What inspired you to set up the Nithya Priyan School of Yoga? As a yoga teacher, my classes have gravitated towards creating the best possible experience for the student to benefit from the fruits of the practice in a safe and non-threatening way. This drew my attention on structuring my classes in peak pose based sequences that focus on individual aspects of the practice in each class to maximise learning. Naturally, then the next step would be to group and organize these individual classes into a coherent whole, which became a 27-week curriculum of classes that, though self-contained practices in their own right, string together to form a comprehensive learning experience of all the major physical aspects of Yoga Asana. I then saw the potential of a team of teachers working together to not only express this curriculum in a school-wide syllabus but to also have them take the curriculum forward with their own inputs and contributions so that it continues to improve and refine. Thus, the school was formed around the idea of student empowerment through structured learning. Joy in the Body and Peace in the Heart. If you could spend an hour with any one person, who would it be and why? I would like to meet Myself. This might seem like a gimmick answer, but consider that many of us live our lives absorbed so much in our wants and needs, in our dramas and our obsessions that we do not spare a thought about who is the one wanting or needing, who is participating in the dramas and who is doing the obsessing. Or we might think we know that answer but upon deeper examination, who we think of ourselves might amount to nothing more than the accumulation of a personal history of successes and failures, euphoric or sullen memories, loss, and gain. The search for the Self is a turning inward from the colorful painting of sensory and intellectual content towards the canvas behind the painting itself, to understand that who one truly is is something truly beyond what we know. It is the goal of all meditative and spiritual pursuits. If you could spend but an instant with your Self, the experience would transform you, your attitudes and compulsions would soften, life would become a lot less serious and threatening, and you would find a joy that is not dependant on external circumstances. Wouldn’t the Self be a great person to meet for an hour? Tell us more about the upcoming Open Heart Retreat. This weekend is specially curated by Om and Away and The Nithya Priyan School of Yoga to allow attendees to simply take time to themselves and explore a quiet and introspective practice of yoga, pranayama, and meditation. Through the gentle, non-religious and mindfulness based technique of Heart Breathing, I hope to deepen your ability to focus and concentrate, eliminating mental noise and clutter, and guide you towards a deeper sense of One-ness and Connection through working towards removing the obstacles that stop you from experiencing Joy in the Body and Peace in the Heart. The unique and beautiful part of the experience is that we will set up luxurious bell tents on the beach as accommodation for the night to allow one to be connected to nature and its surroundings. The climax of this retreat will be a beautifully candlelit evening under the stars in a special Group Meditation, having spent the day preparing Body, Heart, and Mind. Who do you hope to see on a yoga mat at the Open Heart event? I would love to see the familiar faces of my regular students who attend my yoga classes take their practice a step further into meditative practice and attend this retreat. One hour is a short time to explore the length and breadth and scope of the practice. Some people find themselves jaded or bored by yoga after a year or two, not knowing they have only scratched the surface. This retreat would be the perfect platform to explore beyond asana and perhaps rekindle your passion and enthusiasm for Yoga. Of course, I would also love to meet new faces of any experience level of yoga or meditation. Beginner and experienced alike will benefit from the intense period of focused work afforded by this retreat. What do you hope for this person to achieve by the end of the weekend? I would hope for the participants to have deepened their concentration span, quietened their minds and prepared their bodies so that, moving forward, their chances of a successful and consistent meditation practice is improved. What would you say to those considering attending the event and are unsure of what to expect? Come without expectations. Attend with enthusiasm. Leave with joy. What drew you to collaborating with Om & Away? Om and Away sets itself apart from the competition as a company that curates and handpicks the retreat experiences they share with quality and attention to detail. They are collaborative in their approach, and the partnerships they form are with exciting companies with compelling concepts. This results in a very interesting portfolio to which I am very excited to be a contributor to. Click HERE for more information on the Open Heart Retreat, and to book yourself a spot!